In the October 2 issue of Publishers Weekly, the publication revealed the results of its annual salary and jobs survey. One of the questions the 442 respondents answered was, What is the #1 issue facing the industry in 2017? The relationship with Amazon has been fraught from the beginning. Yes, we hate Amazon because it is monopolistic–and more so every day. But where do many (most?) readers buy their books? Uh, Amazon. Publishing looks to the Bowker Report to collect these numbers, and it takes some time for Bowker to assemble them, but this is how the stats stood in September 2016: More than 700,000 books were self-published in the U.S. in 2015, which is an increase of 375% since 2010! The number of traditionally published books climbed to over 300,000. The net effect is that the number of new books published each year in the U.S. has exploded by more than 600,000 since 2007, to well over 1 million annually. At the same time, more than 13 million previously published books are still available. In 2016, the U.S. population was reported at 323.1 million. Think about how many avid readers would be needed to sustain the present explosion of available books. Is it any wonder that a new title has a few weeks at a retail outlet to sell through to a customer? And how is the reader supposed to ferret through this vast selection to find the books that interest him or her? The problem is staggering. Twenty-five percent of the respondents are concerned about a publishing variable that is easy for each publisher to track–how many books sold this year? The sobering fact publishers picked this as their primary concern is that it’s core to the industry. Publishing’s function boils down to selling books. If it doesn’t succeed at this, it won’t succeed at all. And it isn’t like 2017 is the exception. No growth has occurred for five years. Link to the rest at Books & Such Literary Management and thanks to David for the tip. If only Amazon would just go away, everything would be so much better in the world of Books & Such. If only Amazon would increase its prices a lot, everything would be so much better in the world of Books & Such. If only there weren’t so many books, mostly sold from Amazon, everything would be so much better in the world of Books & Such. If only publishers could sell more books, everything would be so much better in the world of Books & Such. If only we could return to the good old days. The simple fact is that the best way to make money in the book business in 2017 is to sell ebooks. All an indie author or a publisher needs to do is create an electronic book file, upload it to Amazon, etc., (or maybe just Amazon) and wait for the monthly checks to arrive. PG suspects the math is pretty much the same for small and large publishers. No printing costs, no inventory management, no Ingram fees, no shipping fees, no returns and nobody needed to manage the whole printed book mess. If you must have printed books, PG suspects that a print-on-demand operation like CreateSpace is probably the most profitable way of doing that if you track down the fully-loaded costs of all the various people and operations in creating, maintaining and managing an inventory of printed books. It’s no wonder that traditional publishing is such a low-wage/low-profit business. The underlying problem for Books & Such and a lot of other agents and publishers is that the reason authors pay them so much is that they are gatekeepers – gatekeepers to publishers who don’t want to spend time reading submissions from authors, gatekeepers to printed book sales via Barnes & Noble and other traditional bookstores. Gatekeepers make their money by charging people who want to go through their gate. And gatekeepers in the book business don’t just charge a toll one time. The book deal that is closed to day will pay the large majority of the money the book generates to the gatekeepers that permitted the book to enter the traditional stream of book commerce. And, to add insult to injury, the gatekeepers will continue to receive the same toll for the rest of the author’s life. Plus 70 years. The author will be dead and the agent will be dead and everybody who worked for the publisher when the book was released will be dead. But the tolls will continue. Some time, PG needs to calculate the total payments made to gatekeepers during the hundred-odd years before the copyright expires on a book. If the current US copyright laws had been place when Ernest Hemingway wrote, given that Hemingway died in 1961, his agent and publishers would continue to receive their gatekeeper tolls until 2031. Gatekeeping tolls in the form of agents’ fees and publisher’s share of book sales would still be payable for The Sun Also Rises, first published in 1926. PG says fewer and fewer authors are interested in walking through those particular gates. The simple reason is that there is an alternative and that alternative pays better than traditional publishing does for most authors. More and more writers are realizing that if they want to be professional authors and earn their living by writing, they are much more likely to reach their goal by self-publishing ebooks and selling them online. About 75% of adult fiction and non-fiction books (including both traditional and indie published) were sold online (77% of fiction, 72% of non-fiction) in 2016. In early 2017, Big Five publisher sales on Amazon were 20.8%–or barely one fifth–of all Amazon US consumer ebook purchases. Looking at earnings of debut authors from the past five years, more indie authors are now earning a $50K-or-better living wage from Amazon than all of their Big Five and Small/Medium publisher peers put together. Fewer than 115 Big Five-published authors and 45 small- or medium-publisher authors who debuted in the past five years are currently earning $100K/year from Amazon sales. Among indie authors of the same tenure, more than 425 of them are now at a six-figure run rate. Daryll Packer has been waiting patiently for his vision of a children’s book series to become a reality. He wrote the books several years ago while he was in Afghanistan working. In 2014, Daryll found Renne Gibbs of Cranberry Quill Publishing to publish his four books. Daryll put down $6,394 as a non-refundable deposit. The contract states the books will be ready in 10 months. Daryll says it was tough to get updates on the progress. He said he paid another $3,100 toward the publishing costs, thinking if he paid more to Gibbs, more work would get done. At the 10-month mark, the books still weren’t done. Daryll’s wife, Pam, said Gibbs told them she was dealing with family health issues. A new contract was signed and because of the delays, Gibbs did refund $3,100 of the $9,000 they paid so far. He said he went to Cranberry Quill Publishing to see Gibbs. “She just overcame with guilt – ‘I’m sorry, give me another chance,’ ” Darryl recalled. Daryll gave her some more time, but nearly two years after hiring Gibbs, still no books so Daryll just wanted to part ways with her. However, he wanted the $6,394 non-refundable deposit back, something Gibbs wasn’t willing to return. “It’s non-refundable when you produce a product, but you didn’t produce a product, so where’s my money?” Darryl asked. Daryll got in touch with me and I got in touch with Renee Gibbs. She said contractually she doesn’t owe the Packers any money since the deposit is non-refundable. But she added that she wanted to do what is right and fair, and admitted that the communications were not the best they could have been when the project was delayed because of her family crisis. Daryll said he’s happy it’s behind him and that he got his $4,400 back. He is now moving forward with finding a publisher for his books. Link to the rest at ABC News 11 and thanks to Meryl for the tip. The DataGuy portion of the podcast begins at about the 9:00 point. Thanks to Karen and others for the tip. When we were done, we were looking at the most comprehensive international picture of English-language ebook sales available anywhere. Unsurprisingly, Amazon is the majority retailer in just about every market. But in Canada and Australia, Amazon is a lot less dominant than in the US and the UK. The remaining 3%–ascribed to GooglePlay and all remaining channels–is most likely overly optimistic. Their true share might well be even lower. 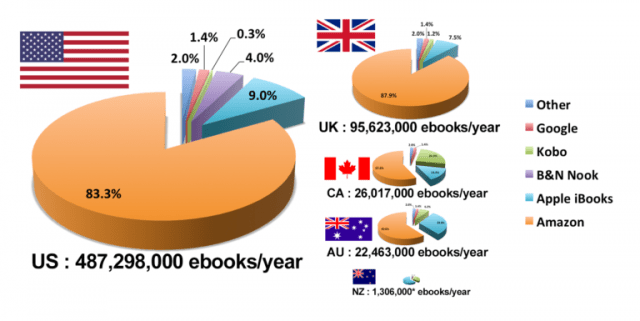 Self-published indie authors are verifiably capturing at least 24% – 34% of all ebook sales in each of the five English-language markets; it’s not just a US-only phenomenon. When you also include the uncategorized authors, the vast majority of whom are also self-published, the true indie share in each market lies somewhere between 30% – 40%. Indies are competing particularly well in the Canadian and Australian ebook markets, nearly approaching the level of dominance they currently hold in the US. The Big Five, on the other hand, are letting themselves progressively get squeezed out of nearly every English-Language ebook market. They make up only 38% of Canadian ebook purchases, and that’s the country where they are holding their ground best; in the US, the Big Five now account for barely 26% of all ebook sales. Amazon Imprints have made the most market headway in the US. Despite being single-retailer exclusive to Amazon Kindle, the dozen or so Amazon “house” publishing imprints between them account for 14% of all US ebook sales, 10% of all UK ebook sales, and 8% of Australian ebook sales. 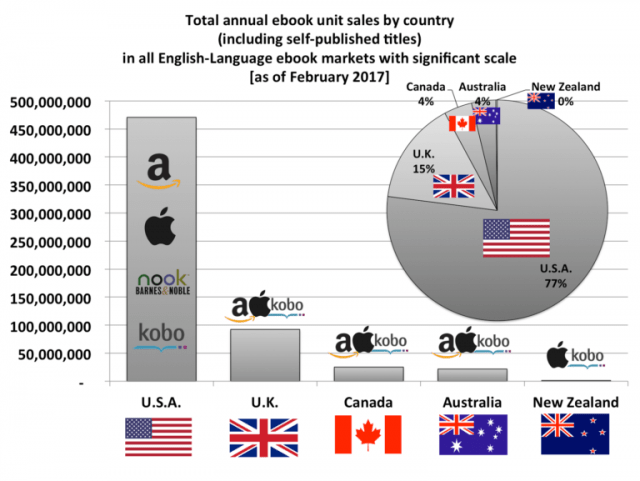 In Canada, the Amazon Imprint footprint is a much more modest 3% of all ebook sales, largely due to the substantial shares of the overall Candian ebook market held by Kobo (25%) and Apple (14%). In the past two years, Data Guy’s Author Earnings reports have become an increasingly popular resource for authors, shedding light on aspects of the publishing industry that were going previously unreported. But the reports have also spurred a great deal of controversy. While some within the industry think they are vital tools for authors everywhere, there are others who criticize the data and think the conclusions resulting from them are worthless. There are of course many in the middle who believe the reports are admittedly far from perfect, but necessary nonetheless. Why do you choose to keep your identity anonymous, and is there anything that you’re willing to divulge personally? I think the anonymity kind of goes back to where I was at when we started. Much by happenstance I discovered there are some advantages to staying anonymous. Back when I first pulled the data, it was really for my own information. I had just been approached by one of the top imprints in my genre, and they were making an offer on one of my books. It had done really well as an indie published release, and they could see it was selling well, ranking high on Barnes & Noble, Amazon, featured on devices, racking up reviews, etc. So they approached me, and I was negotiating with them and I was pretty excited. But, you know, I’m a numbers guy by my other career—my non-writing career—and I was looking for data to help me make my decisions. And there really wasn’t any data out there on what I needed. The official industry stats were kind of blind to half of the story. They didn’t cover indie publishing at all. And so I’m in the middle of negotiating with that publisher, when I pulled this data, and I look at it. I share it with Hugh, and we decide to publish it. But I didn’t want my involvement with Author Earnings to interfere with the discussion that I was having with the publishers. So based on all the research that you’ve done into ebook sales and where the money is going, is there one piece of strategic advice that you’d offer to Big Five publishers to do things differently than they do now? There definitely is, and I think that DBW may be an opportunity to dig into some of these trends in more detail. In general, my observation is not something that Hugh and I alone are saying. High ebook prices don’t really hurt mega-selling authors with long established careers in all of the airport book stores and Walmart, but what they do that is not good is they damage the discoverability and also earnings of mid-list authors. And particularly the vast majority of debut authors who are brand new. No one knows who they are. They need to first find their own audience and fanbase among avid readers before their publisher will put a significant amount of marketing and funding behind pushing them to a more casual, broader audience. The industry’s changed, and the dynamics are not the same as they were when today’s traditionally published mega-sellers first came up a decade or more ago. Most avid readers today read digitally. When you look at who’s reading 50 books a year, 100 books a year, those are the folks who are giving new authors a shot. I’m not talking about the seven-figure advance, Pulitzer Prize, one-of-them-a-year mega-debut author; I’m talking about the vast majority of traditionally-published debut authors who are trying to build a name for themselves. And the digital readers, these avid readers, are basically bypassing those authors, because they don’t recognize the names, and the price is off-putting to them. This is a bit of a long-winded question, but it’s the one that I’m most curious about. Your feelings or anyone’s feelings toward the Big Five publishers aside, how do you personally think the rise of self-publishing has affected our literary culture as a whole? Not too long ago, we had gatekeepers who let only a minority of potential authors past. Now with self-publishing and further avenues to get a book out there to an audience, literally anyone can be an author, and as a result, the number of books published per year has, frankly, exploded. For individual authors, this is great news: they can now achieve their dreams and publish a book. But taking a step back, with the gatekeepers not holding all the power, and a surge in books published, how do you feel this has changed the culture surrounding books? To put it another way, is the value of a book at all watered down now that anyone can be an author? This is a question that I’m not going to be particularly good at answering. After all, I’m known as “Data Guy,” not “Literary Subjective Opinion Guy.” [Laughs] But with that said, first off, I have no particular feelings about the Big Five publishers, positive or negative. And I think this makes me a little different than a lot of the folks we hear from on various author groups. I’m a brand new author and a new entrant into this industry. I’ve never submitted a query to anyone. I hear a lot of this angst, and there seems to be bad blood one way or another. It’s just lost on me. I don’t get it. I get that some people in this industry feel very strongly about the things that have happened in the past, but for me it’s just a brand new, wide-open field. Let’s see what there is to learn. With that said, I do think that today’s wide-open, democratic world of publishing is a good thing. It’s been a tremendous boon for literary culture and freedom of expression. The gatekeepers were an economic necessity in the past. It wasn’t so much about quality, although these two concepts tend to get tangled a lot, because nobody wants to think of themselves as just serving an economic function alone when working in the arts. It was more about choosing which manuscripts were worth taking a financial risk on. Well, today that risk is largely mediated by the fact that you don’t have to take a big risk to get a book out there in the public eye. At the end of the day, the only gatekeepers that matter are readers. All of this was enabled by three big changes to the historical book publishing and distribution ecosystem. One was the rise of ebooks, which simplified the challenge of putting book content into distributable form and getting it into the hands of consumers. The second was the near-perfection of print on demand technology, which enabled even print books to be offered with neither a significant investment in inventory nor the need for a warehouse to store it. And the third was the increased concentration of sales at a single retailer, Amazon.Between print and digital editions, Amazon sells half or more of the units on many titles and, indeed, may be approaching half the retail sales overall for the US industry. What the rush of indie bestsellers told us a few years ago was that things had changed to the point that a single person with a computer could achieve sales numbers that would please a big corporation going after sales with the tools provided by tons of overhead: careful curation and development, sophisticated production capabilities, teams of marketers and publicists, legions of sales people, and acres of warehouse space. This had not been possible before ebooks. And the market reach of the amateur publisher was extended even further asAmazon’s share of print sales surged as a direct result of retail shelf space declining with Borders’s passing and Barnes & Noble’s shrinkage. I’d suggest that the biggest reason this activity was so feverish 2-to-4 years ago and isn’t so much now was revealed first in a vitally important post by hybrid author and helper-of-indies Bob Mayer and then reiterated by the latest report from the Author Earnings website. What this is telling us is that, whatever deficiencies there are in the way publishers are organized for publishing today, they clearly are able to marshal their resources more effectively for book after book than indies can. PG says it’s interesting that Mike and others associated with Big Publishing debunked Author Earnings for its methodology (which, in PG’s distressingly humble opinion, they took way, way too long to understand) and its results. Beginning in October 2014, as AE released report after report showing indie authors capturing a larger and larger share of the ebook market, the same criticisms continued. Now, when the latest AE report shows an interruption in this trend, AE has suddenly become a reliable basis for saying this self-publishing thing is just a fad and Big Publishing will be fine after all. While he doesn’t have any inside information or amazing predictive powers, PG says market data, particularly sales data, flucutuate. While AE is a brilliant idea, it is a snapshot based on one day’s sales ranks on Amazon. A series of eight AE reports from October 2014 to May 2016 showed that indie authors were capturing a larger and larger portion of ebook sales. With each report after the first, a trend emerged and its reliability strengthened. The first AE snapshot was not a fluke, created by a single day’s fluctuation. Neither was the second, etc. While PG was as surprised as anyone that the latest AE report showed a reversal of the previous trend, sales data fluctuate. We’ll have to see several more AE snapshots to understand what, if anything, is changing. However, the economics and technology that underlie indie authors and their success with self-publishing haven’t changed. Large numbers of people who become more and more accustomed to spending their days and nights reading emails, texts, news, etc., etc., etc. from their phones and tablets are unlikely to suddenly decide they really want to read a physical book. The aggressive pricing of ebooks practiced by indie authors is not going to lose its power to attract new readers and retain existing ones. We are not going to see a larger number of physical bookstores opening than are closing. A bookstore is a lousy financial proposition. It’s not going to become easier for traditional authors to support expensive traditional publishers operating in high-cost cities. As time goes by, readers will continue to discover that indie authors produce books that equal or exceed the quality of those created by legacy publishing. Once that discovery is made, it is not forgotten.